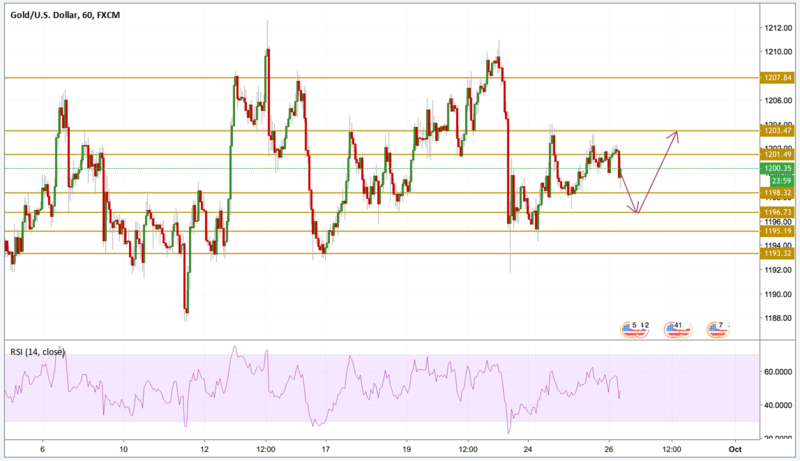 Gold was taking advantage of some weakness in the greenback during yesterday's session but failed to break above the $1204 level as investors get ready for the FOMC meeting with mixed feelings. The Dollar's fate will depend on whether the sentiment is going to be hawkish or dovish, hence, the direction for the yellow metal will finally get clearer and potentially lead to a breakout from the sideways price range. Gold has been consolidating within the familiar sideways channel, meeting a recognizable resistance at $1203.4 up from yesterday's support down at $1199. The price is currently hovering around the $1200 level and we expect it to continue testing the narrow support and resistance levels. If the price is to gain some bullish momentum allowing the price to surge, it will gain it from the lower range of the channel at $1196.8 support level and then we will be focusing on the $1204 resistance level.